Darlings let’s admit it once and for all, the only thing more important than the cute boy in our life is how the cute boy in our life smells. One wants a scent that is captivating and pleasing to the senses; a fragrance that lingers in your memory long after the person wearing it has vacated the room. AXE’s new Twist product is precisely that. Available in the form of an antiperspirant invisible solid, deodorant stick, deodorant bodyspray, or shower gel; AXE Twist was created with input from Ann Gottlieb – the brainchild behind Calvin Klein’s Eternity and Obsession – and features a blend of lime and citrus flavors with sandalwood and cedar undertones, the absolute perfect blend for a sultry summer scent for the boy in your life. 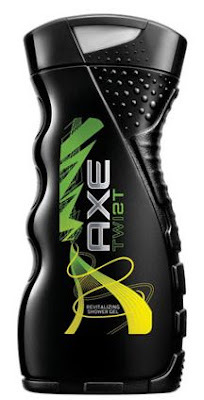 But perhaps the most redeeming quality is the fact that, unlike many fragrances that are made specifically with male or female in mind, AXE Twist features an androgynous ambiance that makes it perfect for your cute boy or yourself. Now that I’ve tried AXE Twist myself, I believe the time has come for you to try it; thus the reason why five (5) of you glamorous gals will be taking home an exclusive AXE Twist Pack – which includes the AXE Twist deodorant spray, deodorant stick, and antiperspirant stick all packaged in a Swiss Army brand toiletry bag – to keep for yourself or give to the cute boy of your choice! ♥For one (1) entry, leave a comment on this post stating what your favorite scent for a guy is between now and Friday, July 23, 2010 at midnight PST. ♥For two (2) entries, Twitter about this giveaway, and leave a comment on this post stating what your favorite scent for a guy is between now and Friday, July 23, 2010 at midnight PST with your Twitter URL. ♥For three (3) entries, become a follower of Café Fashionista on Blogger/Google Reader/Google Friend Connect/Twitter, and leave a comment on this post stating what your favorite scent for a guy is between now and Friday, July 23, 2010 at midnight PST (if you are already a Café Fashionista follower, please say so in your comment). I will randomly pick five (5) names out of a hat (who knows, one of them could be yours! ), and announce the winners on Saturday, July 24, 2010. Thanks to AXE for the pictures. I like Hugo Boss for guys... soft yet masculine! AXE Essence is the one my hubby wears....YUMMY! I love the smell of snow and cold that my boyf smells like after he has been outside working in the winter. weird but true. Burberry London all the way! My man actually does smell like Axe. I make sure he always stocks up on it,he smells amazing! My man loves Eternity but i think its time to Axe it! But I am far away in Africa. No chance right? Auch! Love you though Erica. I agree, the way a guy smells is very important. This is going to sound strange, but my favorite smell on my husband is cocoa butter body lotion. He used mine once when we were on vacation and I loved it on him and started buying it for him. Very masculine, right? Haha. But I love it! My bf uses some kind of Bulgari soap in the shower and it smells SO GOOD! I will admit to perusing the axe area at Target and telling him to get some...hahaha - true story! and ps - can't believe you have the dream/happen experience too! crazy isn't it? so happy to have found your site! xo and have a great weekend! I don't have any men in my life at present, but I want one who smells of soap. Not some other scent that might be masking a stink, but the smell of clean. Awesome giveaway. This could be a good gift to my brother/father/self. i'm a google friend connect follower! Even though, my sweetie always smells good I would love to win this! My hubby doesn't wear cologne, so this will come in handy :) Though I have smelled Angel on some guys, and I absolutely love the scent! Have a wonderful weekend, Erika ! What a cool giveaway =) I like Armani's Aqua Di Gio for men. I like the scent of musk. I love fresh scent on a guy... I hate it when they wear some overpowering scents... I prefer them to smell like they just got out of the shower. I love the smell of the salty ocean on my guys skin after surfing - fresh, clean and a outdoorsy! I'm also having a giveaway for all my devotees just in case you're interested in entering. I like when my guy wears Axe or Old Spice Endurance. I love old spice deodarant....its a first love smell..ha! I like the smell of musk on my hubby. Your blog is still my favorite! :) Great giveway. I would love to win this for Mark. My favorite scent on my hubby is definitely Acqua Di Gio By Giorgio Armani, but I do like him to mix it up a little. 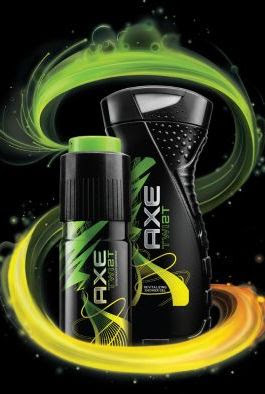 tweeted http://twitter.com/micaela6955/status/18862039780 I think that this Axe scent would be cool with the lime and citrus blend since I love fruity smells!